Geometric takes a structured approach to showcasing two rather non-structured things: blogs and design portfolios. The modifications made possible by the widgetized spaces however, takes all of the rigidness out of this template and enables you to be you. Remember: every WooThemes layout is built on the Woo Framework, making site alterations a snap. Get rid of the clutter, say hello to the structure, and let your work shine with Geometric premium theme! 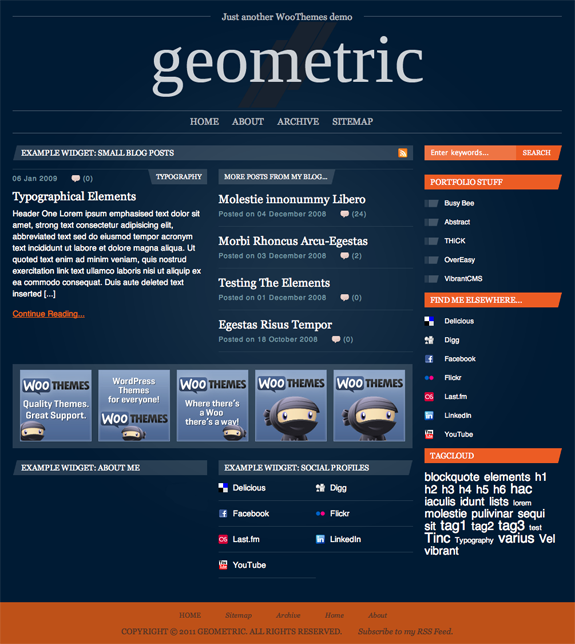 Geometric is a hybrid blog + portfolio, and thus enables you to run both these as an integrated offering on one WordPress installation. A custom home page, which is completely widgetized allowing you to move different widgets (for blogging, portfolio, and social profiles) around as you wish. A completely widgetized sidebar, along with 12 custom (Geometric-specifc) widgets that you can use. Ability to interchange between a left and right sidebar. Styling for both blog and portfolio items that are carried forth throughout the site (category, date-based, and tag archives, along with search results). 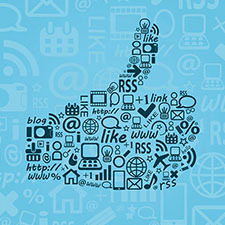 The ability to publish all of your social profiles throughout the site; allowing you to connect with more of your users.